While looking through old documents, it is almost inevitable that the reader's attention will be drawn from the intended target to other articles. The reports below were found in old Ardrossan and Saltcoats Heralds, Glasgow Heralds and minutes of Ardrossan and Saltcoats Town Councils. Although they have no football content, they may be of interest. 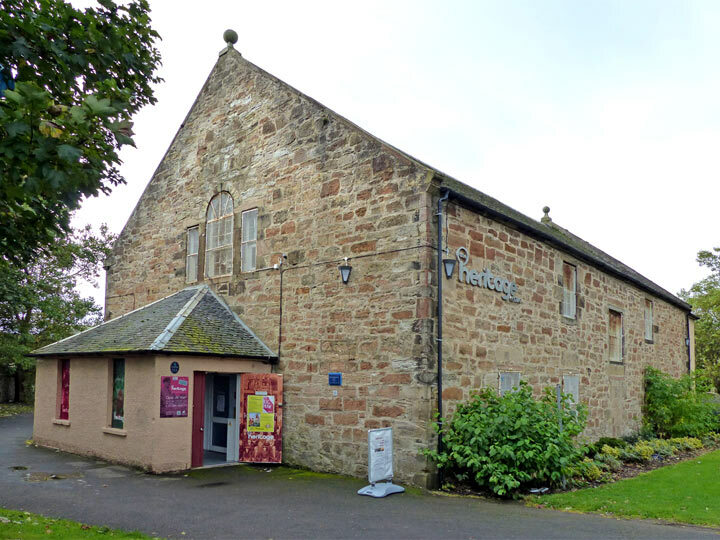 A discovery of considerable antiquarian interest has just been made at Ardrossan. While clearing a quantity of debris from the area enclosed within the ruined walls of the old church, which stood on the Castle Hill within a stone's throw of the castle, a number of burgh workmen came upon a stone coffin (shown below), the lid of which was elaborately carved. When the surrounding earth had been removed, it was found that the lid was lying aslant of the sarcophagus which although it still contained a portion of skull and a few scraps of decayed leather, bore the appearance of having been rifled, probably at some remote date. The coffin lid bears no inscription. The probability is, says our correspondent, that the tomb is that of one of the Barons of Ardrossan, the last of whom died in the fourteenth century. Of the old church on the Hill only the lower parts of the walls now remain. The building was blown down by a gale in 1691 and was never rebuilt. The iconic photograph below must have been taken in late January or early February 1911. Strangely, perhaps, it was not published in the Ardrossan and Saltcoats Herald. The workman in the photo is probably Robert Cook who, it is believed, first noticed the coffin. 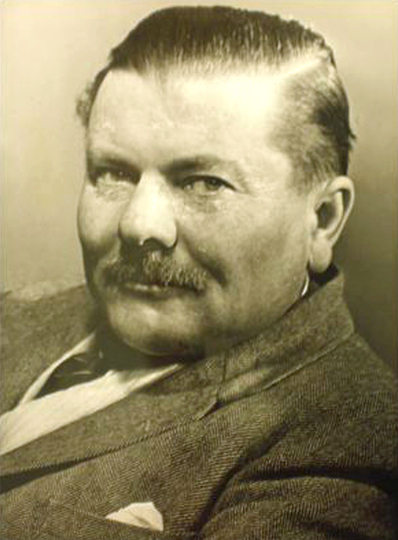 Robert was born in Maybole, Ayrshire, in 1856. 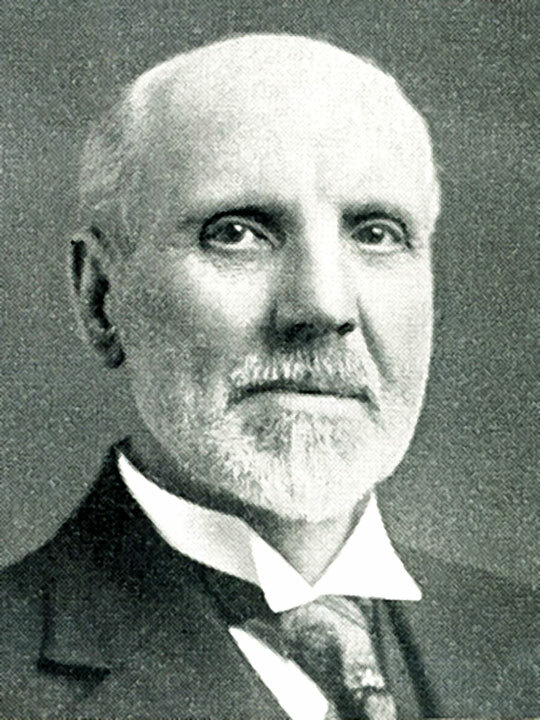 He became a shoemaker and married Bessie Stevenson in 1874. They had ten children. In 1907, the family moved to Ardrossan and lived at 57 Glasgow Street. Robert established a cobbler's shop in Princes Lane before finding employment with Ardrossan Town Council. He died in 1931 at 1 Hill Place which is very close to where he found the coffin. His great grandson, Bob Cook, who emigrated from Ardrossan to Canada in 1957, said "My parents told me that my great grandfather found the coffin". 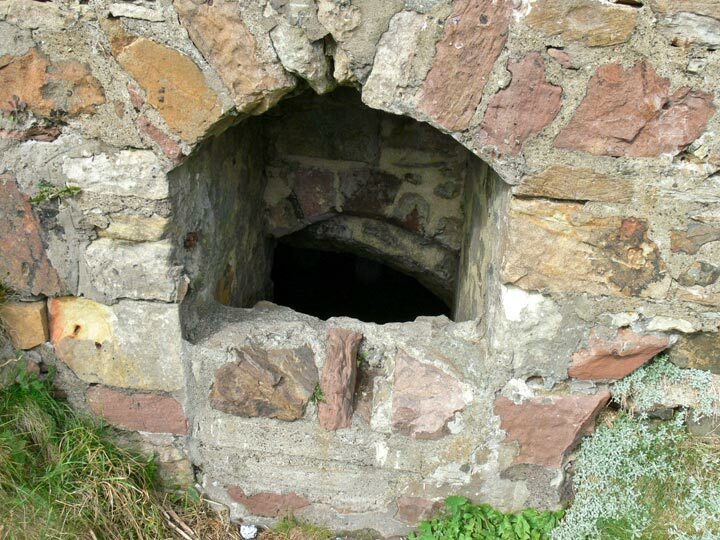 The excavations being made in connection with the old church on the Castle Hill, Ardrossan, have laid bare a stone tomb, the lid (shown below) of which is beautifully sculptured. On the lid being lifted, fragments of bones were found but the lid was 'agee' when found, any articles the tomb may have contained having evidently been carried off on some previous occasion. This tomb is close to the north wall of the church - inside the latter - the head being towards the west. The lid measures 7 feet 2 inches long, being 2 feet 6 inches wide at the head and 2 feet 1 inch at the foot. The thickness is 7 inches. The sculpturing is a bit of fine workmanship. The centre of the stone is occupied by a cross with a long, plain, rather narrow shaft, there being four 'steps' on each side of it at the base. The 'cross' part is placed in a circle 18 inches in diameter and instead of being composed of a simple cross-piece, has eight spokes radiating from a central base right out to the circle but if we allow two of the spokes to represent the shaft, then there will be six radiating spokes. All the spokes are ornamented with trefoils. The space between the shaft and the north edge of the lid is occupied by a straight sword, the point of which is opposite the second step but does not touch it, the scabbard having a rope pattern passing along it lengthwise. From the handle of the sword springs a series of trefoils which extend up to the ornamented circle. The space between the shaft of the cross and the south edge of the stone is filled in by 22 sprays of shamrock, the first one springing from one of the steps at the base of the cross. The north-west corner is filled in with segments of circles and the opposite corner has been blocked out but remains unfinished. The south side has 13 incisions, cut sideways, but not all equal in size, while the north edge has 11 oblong pits or incisions ornamented with trefoils. If the incisions were intended to be ornamental, those on the north side will answer but so much cannot be said for those along the south side. From the above, it will be seen that the principal features of the ornamentation are the trefoils or shamrocks but there are no letters or numerals so that we are entirely left to conjecture as to the date of the tomb as well as the name of the person to whom it was raised. Saint Patrick is said to have used the clover leaf or shamrock by way of explaining to the benighted people of these islands how it was possible for three persons to represent the Godhead and if there is any truth in this legend, the trefoil ornamentation or sacred subject may have had its origin in this way. If that is so, the period of the building of the tomb may have been something between the days of Saint Patrick and the Reformation. The sword evidently indicates that the person laid to rest he had been a warrior and if there is any faith to be put in symbols, the rope on the scabbard may indicate that this warrior was in the habit of going to sea. There are several accounts that give the dimensions of the coffin. Strangely, in none of them is the height given. Measurement shows that, including the lid, it is 2 feet 3 inches. Public interest in the stone coffin which has been discovered at the old church on the Castle Hill at Ardrossan shows no sign of waning. 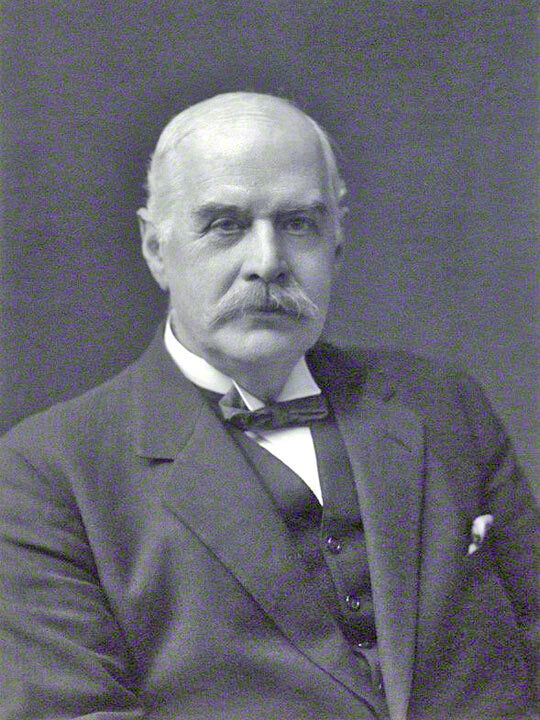 Lord (shown below) and Lady Eglinton paid a visit to the Castle Hill on Friday last (3 February 1911) and, having inspected the coffin, acquiesced in the suggestion that it should be preserved. So far, it is impossible to guess the age of the sarcophagus but an experienced antiquarian may be able to throw some light on the subject. Certainly the person thus entombed must have been an individual of high rank for the commonality were not buried in stone coffins, much less in coffins richly ornamented like that found at Ardrossan. It is unfortunate that at some distant date, the tomb was apparently disturbed for, even if nothing was then removed, it is obvious that the improper re-fitting of the lid has hastened the decomposition of the contents. All that the coffin contained when recently uncovered by the Burgh Surveyor and his assistants was a portion of a skull, a fragment of another bone and a few scraps of decayed leather. These things, it is to be hoped, will be carefully preserved for the leather fragment, in particular, may be of assistance in fixing the probable date of the burial. That the tomb has not been disturbed within the memory of living man until the present time is fairly certain. It is not unlikely, indeed, that no one has touched it since the close of the seventeenth century when, after the destruction of the old church by a gale in the year 1691, the stones were removed to help in the building of the new edifice at Kirkhall. Of course, it is worth remembering that for long after that, there was no town of Ardrossan and the old graveyard must have been a desolate spot, providing ample opportunity for working without molestation to those who may have had any reason to suppose that there was anything to be gained by opening ancient tombs. If it is permissible to make a guess at all it is tolerably safe to assume that the sarcophagus is at least five hundred years old and that it is probably a great deal older. Stone coffins were much used by the ancient Egyptians and frequently by the Romans but in this country, they were employed only for the burial of royalty or of persons of very high rank. The likelihood, therefore, seems to be that the coffin contained the remains of one of the Barons of Ardrossan, perhaps of the thirteenth or fourteenth century. The presence of leather is the coffin lends support to this theory for it is probable that the aristocracy of Scotland had ceased to wear leather garments except for very special purposes by the beginning of the fifteenth century. This was probably the last of the Barons of Ardrossan for the Barony passed with an heir female to Eglinton of Eglinton. The same lady's daughter afterwards married a Montgomerie of Eaglesham who this became possessed of both the Eglinton and the Ardrossan estates which have remained in the hands of the Montgomeries ever since. The Provost made reference to the discovery in the old burial ground on Castle Hill of a well-preserved carved stone coffin and stated that Lord Eglinton, who had visited the Hill, had expressed approval of the Town Council taking charge of the coffin and any other relics which hereafter be discovered. It was accordingly remitted to the Works Committee with powers to take such measures as may be found expedient to preserve the coffin against injury and the action of the weather and place it in such position about the Hill as may be approved by Lord Eglinton. The Burgh Surveyor reported that the work of repairing the footpaths on the Castle Hill had been continued during the month. He had had the soil cleared from the carved stone found in the old church and the stone was then found to be the lid of a stone coffin. It had, however, been moved about six inches out of position, clearly indicating that the tomb had been tampered with. The coffin was found to contain part of a human skull, leg bones and some portions of decayed leather. The probable age of the coffin seemed to be about six hundred years. Lord and Lady Eglinton, accompanied by Provost Chrystie (shown below left), had visited the place on 3 February. His lordship witnessed the improvements carried out by the Council and expressed the wish that more excavation might be undertaken at the Castle. Mr Fawcett (shown above right) said he would like to know what was to be the next step with regard to the coffin. He understood a good many people had visited the place on Sunday and had been disappointed to find the coffin covered up again. he Provost said “It was covered to protect it from the weather in the meantime. Lord Eglinton, I may say, was at one with us in wishing to have the coffin lifted. He seemed very pleased with the work which was done about the Hill and he left it in our hands to do what we thought best with the coffin and the stone. I would ask the Council to remit this matter to the Works committee with powers”. 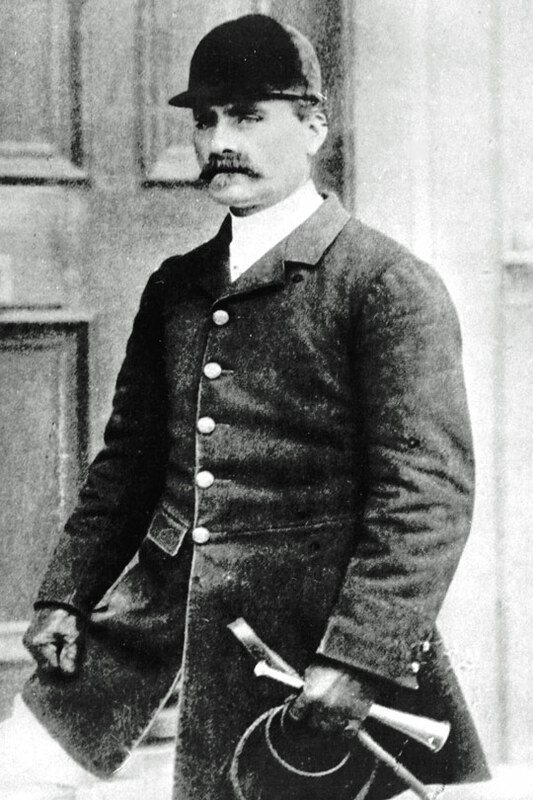 Mr Fawcett asked whether nothing more could be done in connection with the underground chambers in the way of giving something to visitors. He thought a pamphlet might be got up giving particulars of the Castle and a copy could be handed to visitors to the underground chambers. He had been wondering if the convenor of the Works Committee could not give them a revised edition of Harvey’s Meditation On The Tombs – laughter. Bailie Flynn said they might be on the eve of great developments in connection with the Castle Hill. Seeing history was being dug out of the earth there, he thought Lord Eglinton might assist them in the matter. 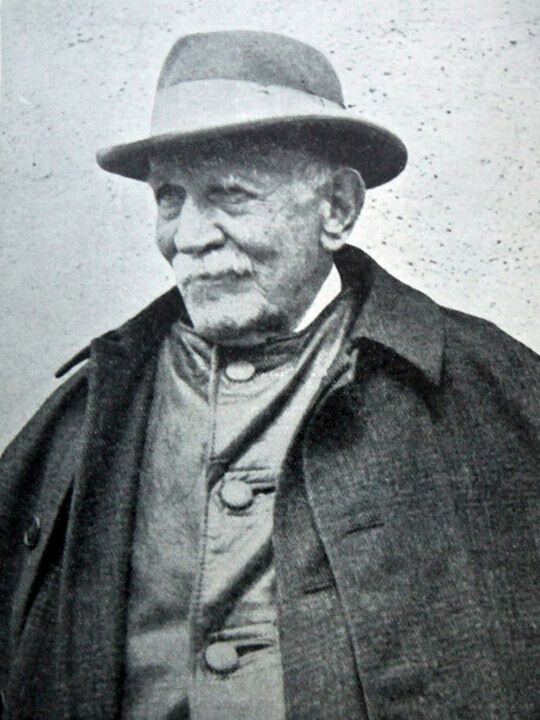 He had read in the local paper about a gentleman who was willing to do something in the way of providing a pamphlet such as had been spoken about and he felt that something could be made of the historical aspect of the subject. Mr Syme asked “Could the Surveyor give us any idea as to how long the stone will last if exposed to the open air?”. The Provost replied that that was being enquired into. Bailie Flinn said “Perhaps the Surveyor would indicate the probable cost of providing an enclosure for the coffin. Mr Duncan, the Surveyor said between £12 and £15. Mr Inglis said the stone was at present full of moisture as a result of lying in the soil and if exposed to frost and sun, it would be apt to burst. If covered till April, however, it could be exposed during the summer when it would dry and become weather-hard, after which it would be all right. It was agreed to remit the whole question to the Works Committee. As reported in the Herald some days ago, an ancient stone coffin with a finely carved lid was recently discovered close to one of the ruined walls of the church on the Castle Hill at Ardrossan. The discovery has excited a great deal of interest and Dr Ross of Edinburgh (shown below left) and Professor Bryce (shown below right), the eminent archaeologists, arrived in Ardrossan on Saturday (18 February 1911) with a view to ascertaining, if possible, the age of the sarcophagus. Dr Ross took careful measurements of every part of the tomb, and will report the result of his investigations at a later stage. In the course of conversation he declared the design on the lid to be Early English. Professor Bryce examined the portion of a skull which was found in the coffin, and a more perfect skull found close by. These he stated to be both of the brachycephalous type, broad and short. The reports of both gentlemen will be submitted to the Town Council in due course. 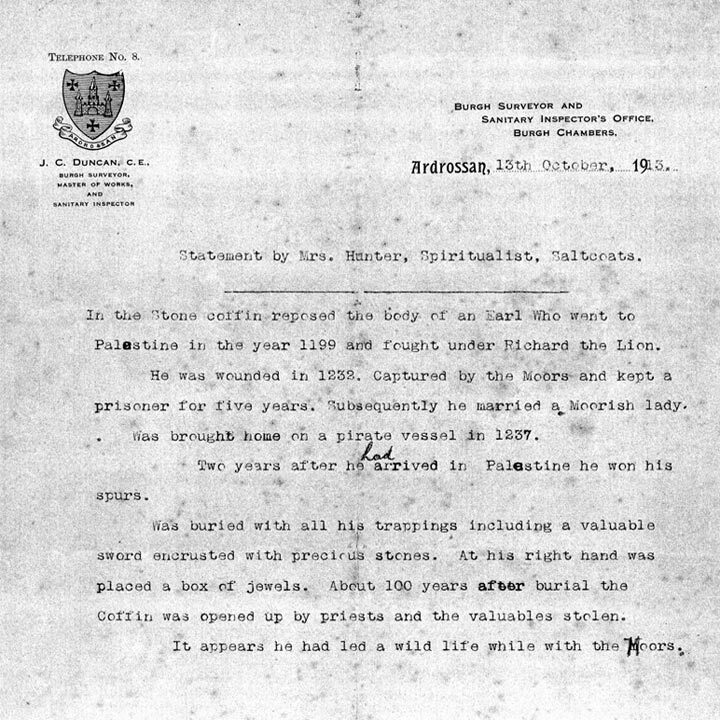 The investigations in connection with the recent discovery of a carved stone coffin at Ardrossan were advanced a step further on Saturday (18 February 1911) when Dr Ross and Professor T H Bryce, representing the Royal Commission on Ancient and Historical Monuments, paid a visit to the Castle Hill. Both of these eminent archaeologists were profoundly interested in the find and, in spite of the torrential rain, spent fully an hour in an examination of the coffin and its surroundings. The conditions were far from comfortable. The downpour had converted the recently upturned soil about the sarcophagus into a quagmire but even the elderly Dr Ross (who was 71 years old) appeared to be oblivious of the fact that he was sometimes ankle-deep in mud so engrossed was he in measuring the coffin and the coffin lid. It may be some little time before the official reports of Dr Ross and Professor Bryce are published but when they do appear, they will provide most interesting reading. Meanwhile, we are able to state that Dr Ross definitely attributes the coffin to the twelfth century. In this case, the tomb is even older than we supposed. Unfortunately, the date of the building of the Castle is not known but it is probable that it was not very long in existence before the first records of its inhabitants. As we stated a few weeks ago, the first known Baron of Ardrossan was named Barclay and he witnessed a charter in 1140 for the foundation of the Monastery at Kilwinning. It is certainly improbable, we should think, that the Castle was in existence for any great period before that time and, while there may have been previous Barons in the locality, it is possible that Barclay who witnessed the Kilwinning charter was really the first, in which case the coffin may have been his. In any case, the fact that one such coffin has been found naturally suggests the possibility of there being others. If the whole area of the ancient church were dug, some very valuable archaeological discoveries might be made. It is reasonable to suppose that if one of the Barons was buried in the church, several of his successors may also have had there their last resting place. To be sure, those were wild times and it may well be that not many of the old Barons died comfortably in their beds or even near home. Some were doubtless hurriedly put out of sight on the field of battle and some may have been drowned. One of them, Sir Fergus de Ardrossan, is known to have been killed in battle in Ireland. Think, for a moment, what must have been the conditions round about when that stone coffin was laid in its place. 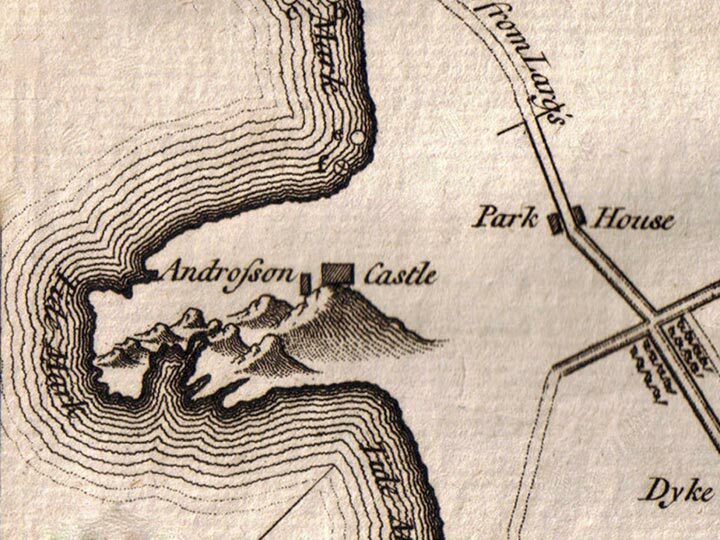 The Castle rock was almost surrounded by the sea (as shown below in a map from 1769) which, in a southerly breeze, sent its spray up the crags to the very walls on the south side. The sea itself in those days was constantly haunted by Norse pirates for the coffin which was unearthed the other day had doubtless been underground for a hundred years when King Haco left his fifteen thousand dead on the fields near Largs (a reference to the Battle of Largs, fought in 1263). Inland, the country was densely wooded, there being whole forests stretching from Dunlop to Darvel and here and there all over Ayrshire. The Monastery and Abbey at Kilwinning were just a-building and a little village was springing up, not where the present town of Kilwinning is, but on the other side of the river. 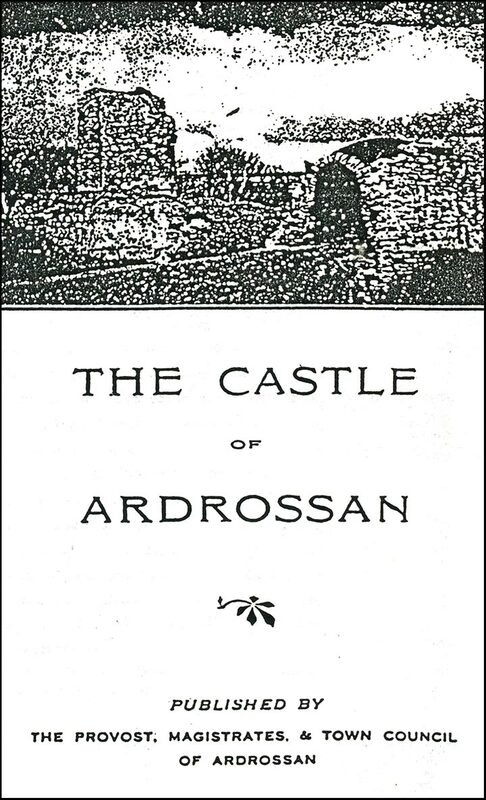 At Ardrossan, of course, there were no houses, no habitation of any kind in all likelihood save those of a few retainers who could not be accommodated within the precincts of the Castle. A noteworthy circumstance connected with the discovery is that the piece of a skull which was found in the coffin and the complete skull found hard by both indicate their their owners had heads of a similar type and that a type not common in the west of Scotland. According to Professor Bryce, who besides being an archaeologist of note is professor of anatomy at Glasgow University, they were of the brachycephalous type which means broad and short when viewed from above, that is, broad from side to side of the head and short from front to back. King Robert the Bruce had such a head but in Scotland, the dolichocephalic or long skull or at least an intermediate type prodominates. At the Castle itself, Mr Duncan, the Burgh Surveyor, had made a further discovery. A portion of a winding stair has been unearthed at one corner of what remains of the square tower. So far as the digging has gone, it seems as if the stair led down in the direction of the vaults but these, viewed from inside, reveal no trace of access other than that already known. Timothy Pont, of course, tells the story about Wallace’s Larder (the entrance to which is shown below) and how ‘in this deepe vaulte in ye bottom of ye reade touer flange he ye carcatches of yesse Englich’. It is possible, therefore, that there may be another vault situated to the west of the two underground chambers with which we are already familiar. STONE COFFIN IN LOCAL MUSEUM? While opinions may legitimately differ as to the propriety of retaining the stone coffin recently unearthed in Ardrossan or removing it to a common centre, there is no question but that its discovery has directed the attention of outsiders to the town where it was found. At a gathering in Glasgow on Saturday (25 February 1911) it was a topic of general interest and impression was conveyed by one and another that the find, for a time at least, will add to the importance of the town. If one of the rooms in Kilmahew was set apart to house curios and an invitation extended to townsfolk here and abroad, to make contributions, we have no doubt but that a collection of rare interest would speedily be acquired. There are natives in every quarter of the world who would gladly enrich a local museum and there are townspeople with relics which they might be willing to part with or lend. This proposal involves no tax and could be initiated without delay. The Provost reported that Dr Ross and Professor Bryce as representing the Royal Commission on Ancient Monuments had visited the Hill and examined the stone coffin and that they had recommended its removal to a place where it would be protected from the weather. It was accordingly agreed that it should be removed to the Burgh Chambers (in Montgomerie Street as shown below in 1978) and placed in the hall on a wooden base twelve inches high and painted black. The Surveyor was instructed to carry out the removal at the earliest possible date and to employ the necessary skilled labour in order that the coffin may not be damaged in the course of removal. The Convenor then moved that the adoption of the second head of report having reference to the stone coffin and this was seconded by Councillor Syme. Bailie McKellar (shown below) moved as an amendment that the coffin should not be moved from the Hill but placed in position there and suitably protected and this was seconded by Councillor McKelvie. On a division, the amendment was not further supported while the motion was supported by the remaining members excepting Councillor Inglis who declined to vote. The Provost explained that Lord Eglinton approved of having the coffin placed in Kilmahew and read an interesting article by Dr Ross and letters from Dr Ross and Professor Bryce bearing on the ruins on the Hill and the finds there. Mr Harvey further reported on the visit of Dr Ross and Professor Bryce to the Castle Hill and to their recommendation that the stone coffin found at the old church should be removed to a place of safety for preservation. The Committee recommended that the coffin would be removed to the hall at the Burgh Chambers and there placed upon a wooden base painted black. 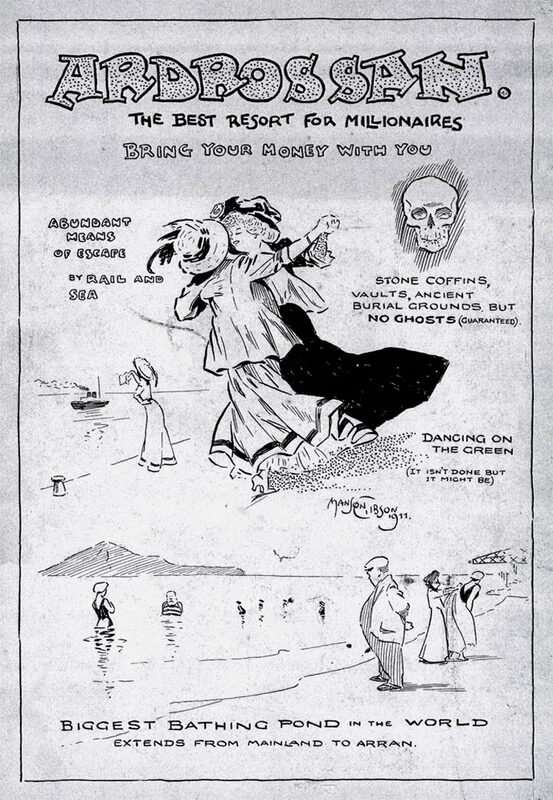 The reports of Dr Ross and Professor T H Bryce will be found in another part of this issue. Bailie McKellar said he did not know where they had got their authority to recommend the removal of the coffin to Kilmahew for the minutes showed that the Committee was instructed to take such steps for the preservation of the coffin as might be approved by Lord Eglinton and he understood that his lordship had expressed a wish that the coffin should be retained on the Hill. He was very sorry that such a report as they had just heard from the Works Committee should have been submitted for he thought the coffin should have been kept where it was. Of course, they had the opinion of these experts that exposure to weather would damage it, yet there were stones at the Castle which had been exposed to the weather for centuries and were apparently none the worse. He did not see why the coffin should not be kept where it was found if it were covered during the winter season and exposed in the summer. Nobody would see it in Kilmahew but let them place it on the Hill and they would have a great many visitors coming to see it, especially on Sundays. That stone coffin was a grand asset, one of the best they had and so he begged them not to remove it from the Hill where it would be a centre of attraction. Captain McKelvie supported this view. He thought the coffin should be kept where it was found as Lord Eglinton had suggested. If a cover could be put over it, he would not remove it. Provost Chrystie said Lord Eglinton had been down again since that opinion had been expressed and, after hearing that Dr Ross had been so strong on having the coffin removed to a dry place of safety, he concurred in his suggestion that it should be removed to Kilmahew. Dr Ross had said that it should be removed to a properly heated place otherwise it would be claimed by the Royal Commission in London and the Council would not only lose it but would have to pay for its conveyance to London. 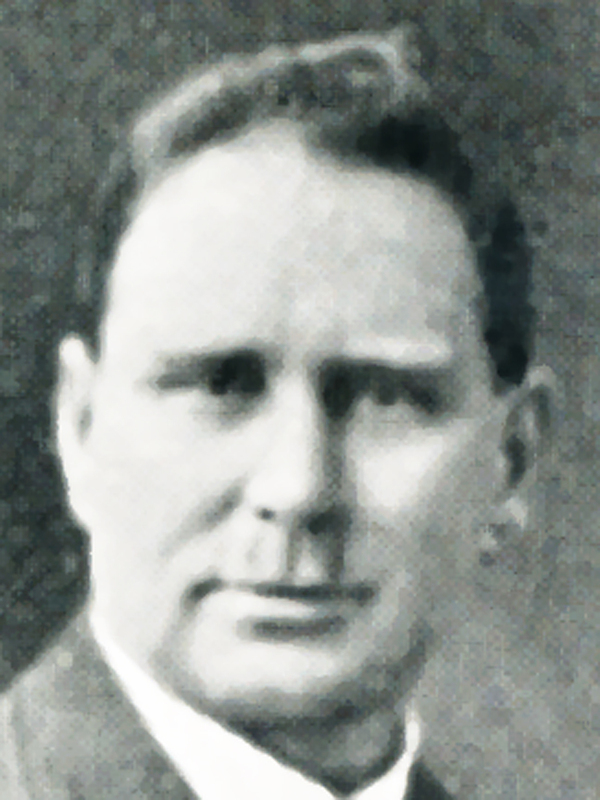 Bailie McKellar said that he coffin belongs to the Parish. They could not take it away. Mr Harvey replied “Oh, no. The Royal Commission on Ancient and Historical Monuments have power to take possession of these things”. Bailie Flinn said it might be that they were on the eve of some great developments in connection with the antiquarian aspect of the Castle and not improbably a small museum might one day be placed on the top of the Hill in which case, the coffin could be safely housed there. It was ultimately agreed that the coffin be removed to Kilmahew. Many people will read with interest the reports of the two expert antiquarians who visited Ardrossan recently in connection with the discovery of a stone coffin at the Castle Hill. Dr Ross and Professor Bryce represented the Royal Commission on Ancient and Historical Monuments Scotland, the former concerning himself mainly with the coffin and the Castle while the latter, who is a professor of anatomy in Glasgow University, interested himself in the human remains. Dr Ross reported that the ruined church is situated about 130 yards north-east from the Castle near the north end of the ancient burial ground. This is quite typical of the position of a mediaeval church with a graveyard where the graveyard extends northwards of such a church, it will generally be found to be a later extension. The church, of which all traces were nearly obliterated, measures about 56 feet 8 inches from east to west by 20 feet from north to south interior and 64 by 25 feet 6 inches exterior. This last measurement is a mistake as the dimension is actually 35 feet 6 inches. The walls stand to a height of about 4 feet 6 inches above the foundation and are well built of good large courses. As usual in old churches, there is a north and south door opposite each other and situated towards the west end (as shown in the above plan drawn by Patrick Murray). The north door, 4 feet wide, has three steps down to the floor. The remains of only one window exist. It is 2 feet wide and widely splayed inwards. This is the only indication of a window remaining but doubtless, there would be one in each gable. Possibly there was none in the north wall as the north side of a church had an evil reputation as we have seen in regard to the graveyard. Opposite the window, there is a recess about 6 feet wide in the north wall. This is the usual position of an Easter Sepulchre such as exist in Stirling Parish Church, Kinfauns Church, Perthshire, Saint Giles, Edinburgh and other places. Here the consecrated host and crucifix were deposited and a watch set for three days and nights when on Easter morn, they were removed to the high altar amid much rejoicing and singing Christ Is Risen. At first I thought this might be a sedilia but on reflection, I never saw such a seat on the north side of a church and I am satisfied that is was an Easter Sepulchre and it might also have been a tomb at the same time as they were often used for the same purpose. Considerable portions of the stone pavement remain towards the east end with one step up to the altar. I now come to one of the most remarkable and interesting finds made during the excavations – indeed, I might say made in Scotland in recent years. This is the discovery of the complete stone coffin with its lid all in situ. It stands close to the north wall at a distance from the west gable of 23 feet 2 inches. It measures 7 feet long outside and tapers from the west end, the head, from 2 feet 5 inches to about 2 feet at the east end. It is shouldered with a circular cavity for the head and is 6 feet 4 inches long inside by 12 inches deep and, as is usual, about 1½ inches less in depth at the head which thus, as it were, rested on a pillow. The coffin was full of earth when I saw it but there is probably a hole in its floor about the middle. The carved lid is, so far as I know, one of the finest things of its kind in Scotland and is a specimen of mediaeval art at its purest and best period, not later, I believe than the thirteenth century. It would not be out of place in any collection of carved lids to be found in English churches and cathedrals and the only one in Scotland, so far as I remember, that approaches it in beauty of design and execution is in the Dudhope Castle Museum, Dundee. The lid is 7 feet 3 inches long by 9 inches thick and is moulded all round along the edges with bead and hollow mouldings with a leaf ornament at intervals on the hollow. There is a cross in the centre with a circle at the top, the full width being 19 inches in diameter. This is filled with carving raised crosswise. There are five Calvary steps at the foot and from this there runs up on the dexter side a stem with trefoil-shaped leaves. On the sinister side, there is a sword with a mid rib delicately enriched and upwards from the hilt another stem with trefoil leaves. There is nothing in the design to differentiate it from many others of its class. The sword indicates the knightly warrior character of the deceased, at the same time a soldier of the cross. It is the beauty of the design and its admirable execution which excite our admiration. Coffins are by no means uncommon. They are to be found from early Christian times and all through the middle ages. There is and early one at Govan and in Saint Andrew’s Cathedral, there are some eight of them of the later period. At Lindores and Cupar Angus and many other abbeys and churches, they are to be found. In size, they vary from about 7 feet in length up to 9 feet 6 inches. Two very small ones at Lindores measure respectively 27½ inches by 30½ inches. There are some nine coffins lying at Lindores. In my opinion, the Town Council would be well advised to keep this coffin and lid and not give it up to any museum nor let it go to any exhibition. A cast of the lid might be allowed to be taken. If the church had been roofed and been in use, the proper thing would have been to allow it to remain where it was found but as it was not intended to be exposed to the weather, it should be put under cover in some public building where it can be seen and properly protected and stand as it was found. The position of the church in close proximity to the Castle on the remarkably rocky knoll which gives the town its name and standing away from and overlooking the town, suggests that the church was built in connection with the Castle and for the use of what would then be the small hamlet at the base. There are similar examples at Dunstaffnage and Skipness in the west, at Crichton and Borthwick in the east and at other castles throughout the country and we may be fairly certain that the stone coffin was made for some Lord of the Barony of Ardrossan in the thirteenth century. There does not appear to be much known regarding the history of the church but that there was a church here in 1226 is shown by an agreement between Walter, Bishop of Glasgow and John, Abbot of Kilwinning, whereby the Bishop granted to the Abbot and convent sixteen shillings payable from the Church of Ardrossan in the Registrum Vetus Ecclesia Glasguensis, the Register of the Church of Glasgow (opened at folio 48, the very page that details the agreement). 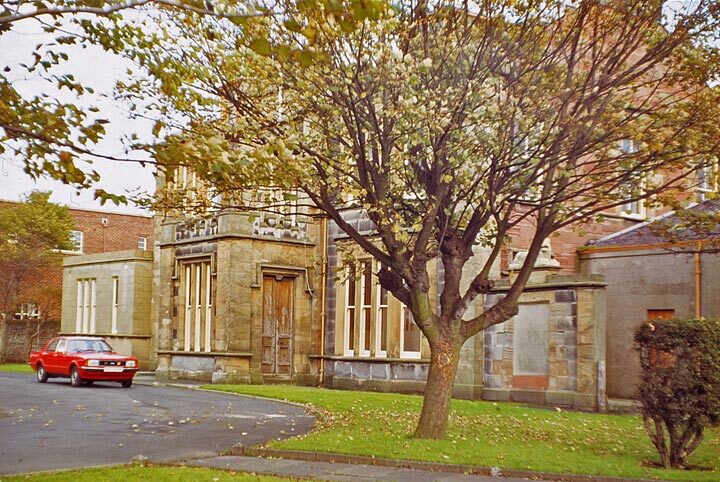 The convent undertook to provide qualified chaplains with sufficient sustentation. I observed a slab lying in the churchyard evidently to the memory of a priest as it had a chalice carved on it. The church was blown down in 1691 by a violent storm. In all probability, the falling of the roof wrecked the walls and the building was never repaired. It was, according to Pont, ‘a goodly parochial church’. Timothy Pont (about 1565–1614) was a Scottish cartographer and topographer and the first person to produce a detailed map of Scotland. He travelled around the country creating maps and drawings. The best way of preserving it would probably be to cement the top of the walls, embedding on this a course of strong stone pavement having a slight projection and the walls should be pointed inside and outside but the pointing should not be plastered on indiscriminately nor brought out to the face of the wall. On the same day, I also examined the excavations being carried on at the Castle and was glad to see that the stair leading to the Castle cellars had been opened up and that another stair leading downwards had been discovered and it is to be hoped that the Town Council will be able to take such steps as will enable them to put the building in a state of repair that will ensure its preservation for many years to come. The rock has probably been the sire of stronghold from an early period but the existing ruins appear to belong to the period of about 1400. 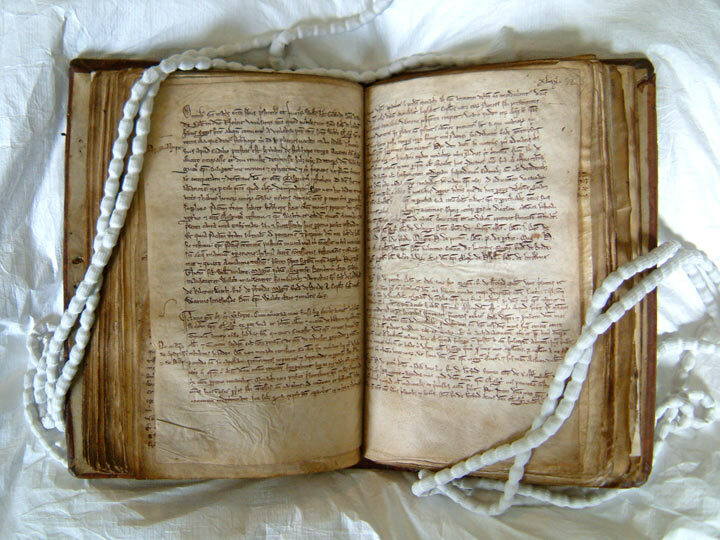 There is a notice of a charter by Alexander, Lord Montgomery, closed at the Castle of Ardrossan in1468, but I need not pursue the subject further and only that I am sure the Commissioners will be gratified to know how keen the interest is that is taken by the Town Council of Ardrossan in their antiquities. Dr Ross has asked me to send you some report as to the bones found in connection with your beautiful sarcophagus. If the skull found within the coffin was that of the person originally buried therein, we may gather that he was a male of full adult age, probably at least thirty-five. The bone of a foot indicates that he was a full average stature. The skull belongs to the type known as brachycephalous, that is, broadly oval in shape. 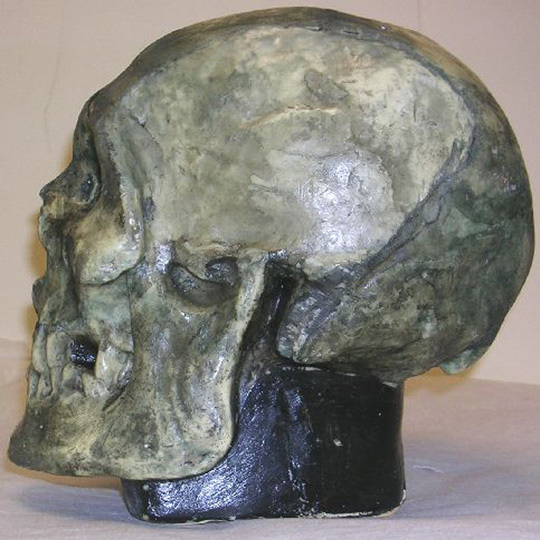 The complete skull found outside the coffin is of exactly the same type and both differ from the average type of skull found in the district at the present day. 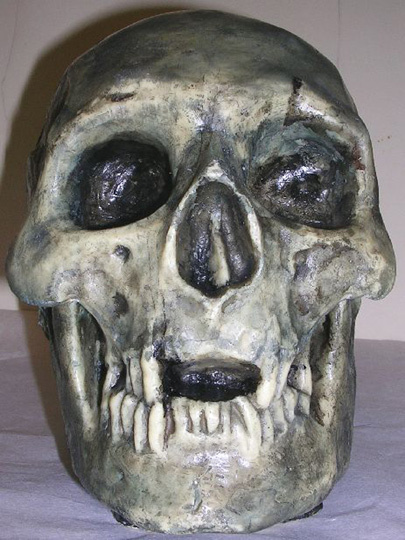 When I first saw the skull, I thought it resembled a cast of a skull reputed as that of Robert the Bruce which I have in my museum. There is certainly a distinct general resemblance but the supposed skull of Bruce is larger and heavier and has more prominent brow ridges. The two specimens are of considerable interest to me. The photographs above show the plaster cast taken from the skull of Robert the Bruce referred to in Professor Bryce’s report. The skull is on display at The Hunterian Museum, University of Glasgow, with whose kind permission the photos are reproduced. Mr Duncan’s report referred to the removal of the ancient stone coffin to the Burgh Chambers, a task which had been satisfactorily carried out. The interior area of the old church had been levelled, covered with ashes and rolled, dressed with whin chips and rolled again. The Provost submitted a letter dated 28 April from Dr Ross, Edinburgh, sending a revised copy of his report regarding the Ancient Church and Castle on the Hill and the stone coffin found there together with the report referred to, in which the services of the Burgh Surveyor in connection with the matter were acknowledged. It was agreed to supply Dr Ross with any information or assistance he may ask for. The Provost submitted a full report from Dr Ross on the stone coffin et cetera found at the graveyard on the hill. The only part different from that already published was an acknowledgement of the valuable services rendered by Mr Duncan, the Burgh Surveyor, in assisting Dr Ross in taking measurements on the occasion of his visit. Dr Ross also reported in complimentary terms on the care with which the excavations had been carried out by Mr Duncan and expressed his appreciation of the plans of the Castle, church and graveyard supplied by the Surveyor. A request by Messrs Arthur Guthrie and Sons, Ardrossan, for permission to take photographs and measurements of the stone coffin for the purpose of reproduction in Goss China was granted. As far as is known, no Goss China reproductions were made. Goss Crested China was typically small white glazed porcelain models, sold as souvenirs. The old church, under the stone floor of which the carved coffin was found, was blown down by a hurricane in 1691, and until 1910, the ruins were hidden by a dense undergrowth of grass. If the coffin was found under the floor, it must have been buried to a considerable depth, considering that its height is 2 feet 3 inches. 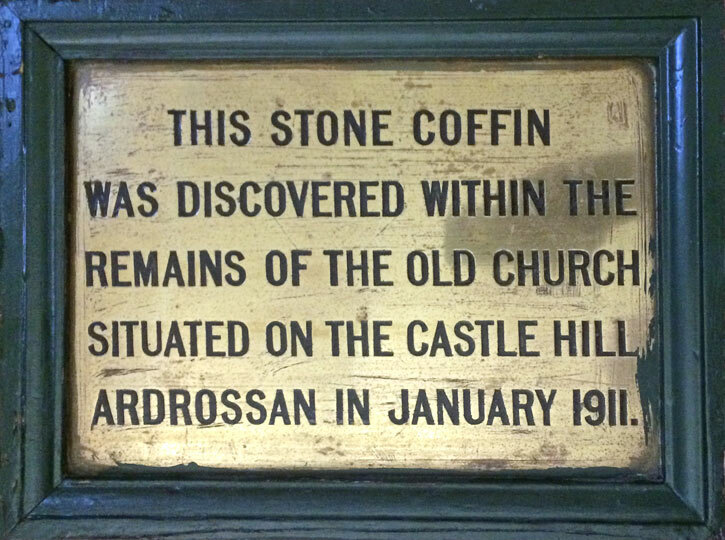 The above advertisement, which makes reference to the stone coffin, was created by Manson Gibson, an employee of the Ardrossan and Saltcoats Herald. It could have been an advert or cartoon in the paper or a separate poster. An excursion to Ardrossan by the members of the Glasgow district on Saturday 26 October (1912) was made on a cold and stormy afternoon and expectation was not as high as to what we were to see but we found a great deal, were most hospitably received by the Provost, magistrates and clergy of the town and under the admirable guidance of the energetic Burgh Surveyor, Mr James C Duncan and Mr P MacGregor Chalmers, all that was there to see was shown to great advantage. Going first to the ruined Castle high perched on ‘the bank of the promontory’ - for such is the meaning of the Gaelic name Ardrossan - we saw how much light can be thrown by intelligent excavation on what was lately a heap of shapeless ruin. Proceeding thence to the recently excavated site of the church which served the Castle as long as that existed and the town’s folk till 1691 when it was wrecked by a violent storm, we found a long oblong building, its chancel of the same width as the nave above which it had been raised by three low steps placed at wide intervals from each other as at Elgin Cathedral. Considerable portions of a stone pavement remain and there is a recess which Dr Ross thinks was an Easter Sepulchre as at Saint Giles, Edinburgh and the old churches of Stirling, Temple and Kinfaus. Within this church was recently found, close against the north wall at a distance from the west gable of 23 feet 2 inches, the antiquity which was our special attraction to Ardrossan, a stone coffin with its lid in situ. The coffin measures 7 feet long outside and tapers from the west end, the head, from 2 feet 5 inches to about 2 feet at the east end. It is shouldered with a circular cavity for the head and is 6 feet 4 inches long inside by 12 inches deep and, as is usual in such cases, about 1½ inches less in depth at the head which thus, as it were, rested on a pillow. The lid is 7 feet 3 inches long by 9 inches thick and has a bead and hollow moulding all round along the edges richly decorated at intervals with a leaf ornament in the hollow. There is, in the centre, a cross with a circle at the top, the full width being 19 inches in diameter. This is filled with carving raised crosswise. The foot of the cross rests on five Calvary steps and from these runs, on the dexter side, a stem with trefoil-shaped leaves while on the sinister side, is a sword with delicately enriched mid rib and upwards from the hilt another stem with trefoil leaves. There is, to one familiar with the Celtic crosses of the West of Scotland, a suggestion, or perhaps a reminiscence, of them but here there is no interlacing and the style of ornament is decidedly Gothic. “The carved lid” says Dr Ross “is, as far as I know, one of the finest things of its kind in Scotland and is a specimen of mediaeval art at its purest and best period, not later, I believe than the thirteenth century. It would not be out of place in any collection of carved lids to be found in English churches and cathedrals and the only one in Scotland, so far as I remember, that approaches it in beauty of design and execution is now in Dudhope Castle Museum, Dundee. It would have been pleasant had it been possible to leave it in its original position but there it would soon have suffered from exposure to the weather while the Scottish urchin has little respect for beautiful objects and nowadays very little dread of the consequences of destroying things. The next most appropriate place would have been the present successor of the ancient parish church but this does not seem to have been thought of and the coffin and its lid are in safe and honourable - if no longer sacred - keeping in their present resting place in the vestibule of the Municipal Buildings. Thither we went to view it and there we were courteously received by the Provost and the bailies. Our next visit was to the new Parish Church of Ardrossan in Saltcoats where we were received by the minister, the Reverend D D Rees and prayers were said. The church is one of the finest of those wherewith Mr Peter MacGregor Chalmers has enriched Scotland. Thereafter, the company was hospitably entertained in the Parish Church Hall. 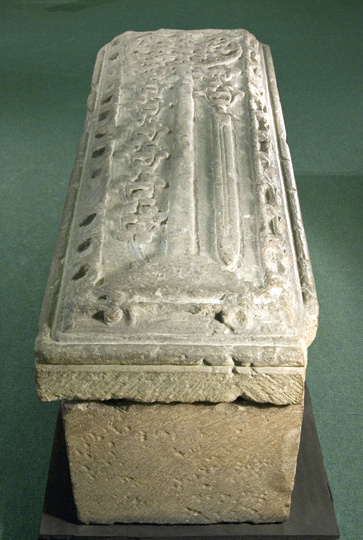 The Scottish Ecclesiological Society preferred that the sarcophagus was housed in ‘the present successor of the ancient parish church’, namely Saint Cuthbert’s Church in Saltcoats, then – and now – the fourth parish church of Ardrossan. The Church, at the junction of Caledonia Road and Campbell Avenue is shown below. On 13 October 1913, Mrs Hunter, a Spiritualist from Saltcoats, gave a statement to James C Duncan, Burgh Surveyor for Ardrossan Town Council. The letter is reproduced above with the kind permission of North Ayrshire Heritage Centre and its text is given below. In the stone coffin reposed the body of an Earl who went to Palestine in the year 1199 and fought under Richard the Lion. He was wounded in 1232. Captured by the Moors and kept a prisoner for five years. Subsequently he married a Moorish lady. Was brought home on a private vessel in 1237. Two years after he had arrived in Palestine he won his spurs. Was buried with all his trappings including a valuable sword encrusted with precious stones. At his right hand was placed a box of jewels. About 100 years after burial the coffin was opened up by priests and the valuables stolen. It appears he had led a wild life while with the Moors. 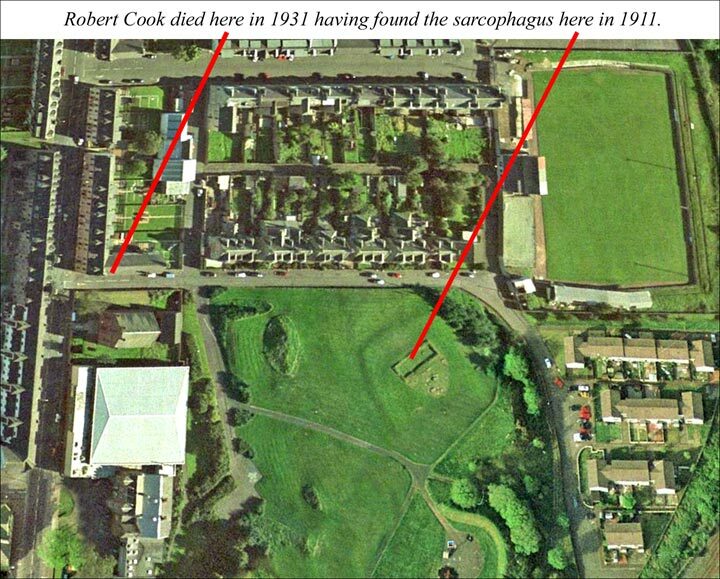 Robert Cook, the man who unearthed the Ardrossan Sarcophagus in 1911, died on 5 June 1931 at 1 Hill Place, Ardrossan. 1 Hill Place is less than 200 yards from where Robert found the coffin. It might be expected that Robert Cook would be buried in Ardrossan Cemetery but this is not the case. 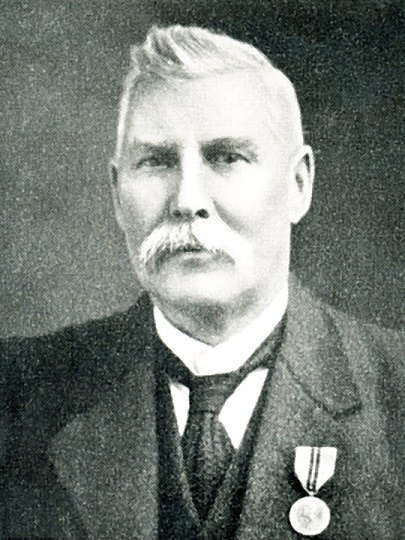 He was interred on 8 June 1931 in Maybole Cemetery in the town of his birth, beside his wife, Bessie, who died in 1924 and his son, Angus, who died in 1895. 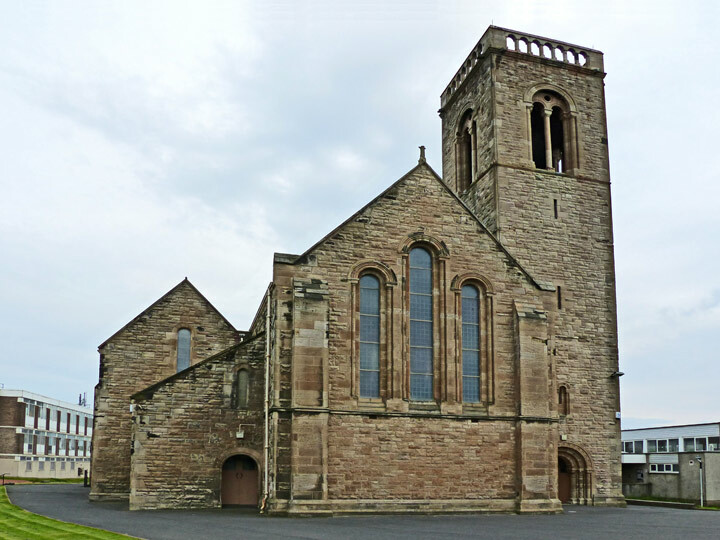 On 2 October 1938, a replacement Catholic Church was opened in Ardrossan. It lies 280 yards due south of the Castle Hill Church. In memory of the altar in the old church to Saint Peter in Bonds, the new Church was called the Church of Saint Peter in Chains. 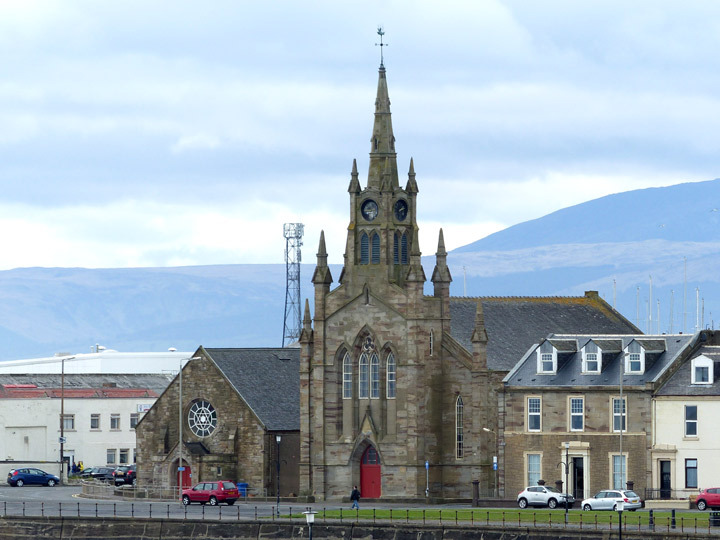 Two hundred yards from where Mass was last celebrated three hundred and fifty years ago for the fisher folk of Ardrossan, a new church dedicated to Saint Peter in Chains was solemnly opened by Archbishop Mackintosh on Sunday last (2 October 1938). 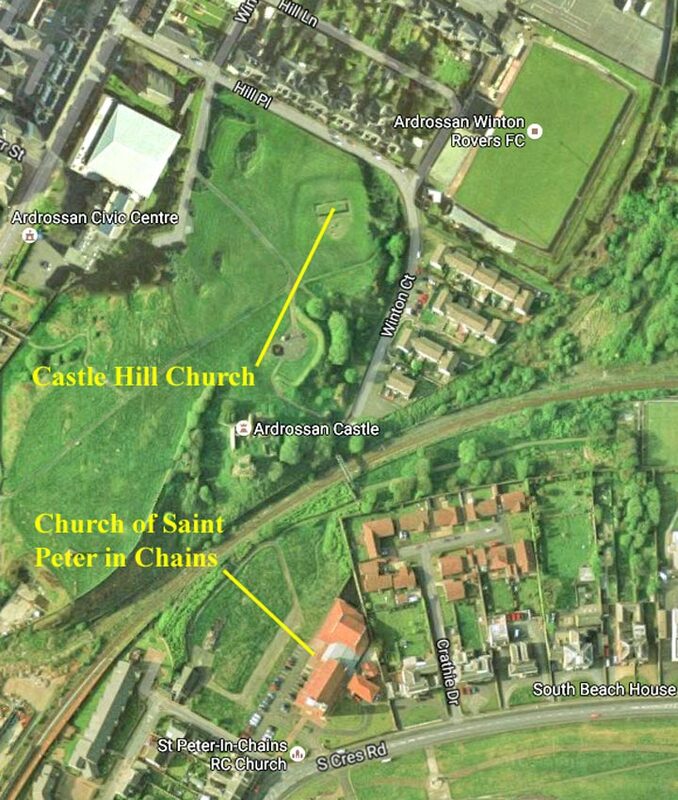 Since the Reformation Ardrossan had been denied a Catholic church, but once again, almost in the shadows of Castle Hill where the sad, neglected ruins of the old church of Saint Peter in Chains still stand, the Holy Sacrifice of the Mass has been celebrated. Ardrossan church originally stood within its churchyard on Castle Hill. Its foundations arestill visible. It was blown down by a violent storm in 1691, when it was replaced by the church described on NS24SW 6. In it were altars to Saint Peter and the Virgin Mary. It was excavated in 1911 when it was shown to be a long, oblong building , its chancel of the same width as the nave, above which it was raised by three low steps, placed at wide intervals. Considerable areas of stone paving remained. A stone coffin, with a carved lid, was found within the church, near the north wall. It was removed to the vestibule of the Municipal Buildings. A thirteenth century date is suggested for it. NS24SW 6 refers to an RCAHMS document on Kirkhall Burial Ground off Stanley Road, Ardrossan. In 1697, Ardrossan Parish Church was rebuilt at Stanley Clachan, near what is now the junction of Stanley Road and Saint Andrew’s Road. The Archaeology Notes recorded the excavation year as 1912 but there is considerable evidence to show that it was 1911. Reference was made to the ancient stone coffin presently in the custody of the Ardrossan Town Council which it is understood the Ardrossan Town Council desired to have removed from their Council Chambers. It was resolved that the Clerk be instructed to write to Ardrossan Town Council and to request that this stone coffin should eventually be made over to the Saltcoats Town Council as an exhibit in their proposed Museum when such a Museum should be set up. Meantime, Ardrossan Town Council should be requested to have in mind, when disposing of the coffin, the claim of the Saltcoats Museum to the eventual custody thereof. Consideration was resumed of the disposal of the stone coffin at present in the Burgh Chambers. A letter dated 30 July last was submitted from the Right Honourable The Earl of Eglinton, shown above, suggested that the coffin might be placed in the Skelmorlie Aisle at Largs which was an old burial place of the Montgomeries of Skelmorlie and was preserved by the Ancient Monuments Board. A letter dated 8 October was submitted from the Minister of Ardrossan Barony Church, shown below as Barony Saint John’s Church in 2015 then disused, stating that the Church would be prepared to accept custody of the coffin and to house it in the vestibule of the Barony Church where it could be accommodated. It was agreed to accept the offer of the Barony Church to accommodate the coffin and it was agreed to get an estimate of the cost of its removal and installation in time for the next meeting of the Finance Committee. It was remitted to the Convenor of this Committee and the Burgh Surveyor to see to the transport and lodgement of the coffin. The Burgh Surveyor reported that the stone coffin had been removed from the Burgh Chambers to the vestibule of the Barony Church on 9 November. 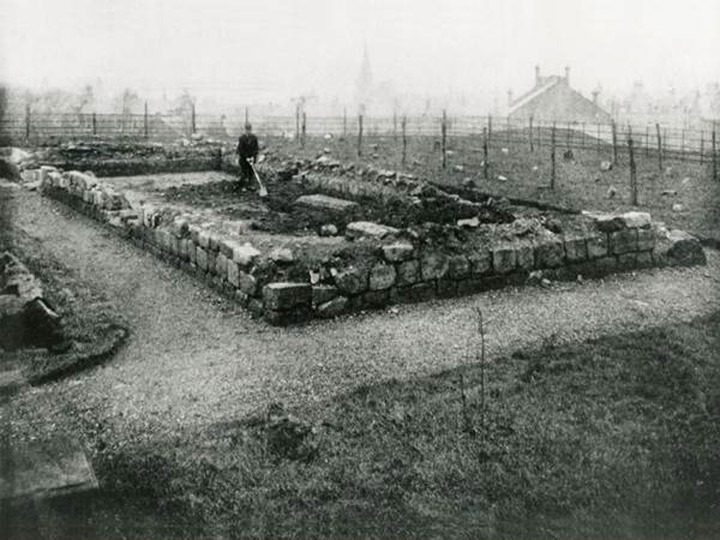 The foundations of this church can be traced, measuring 19.5 by 7.8 metres (64 feet by 25 feet 7 inches). The grass-covered floor lies 0.5 metre (1 foot 8 inches) below the top of the wall, which is 0.2 metre (8 inches) high externally and 0.9 metre (2 feet 11 inches) broad. The masonry is of ashlar. There appear to be two entrances in the south wall, each having a step leading down in to the interior. There are also two small breaks in the north wall. Their purpose could not be ascertained as they seemed too narrow for doorways. The churchyard wall has been removed and the whole area is an open park. A few gravestones still exist, one dated 1662 and some of eighteenth century date. 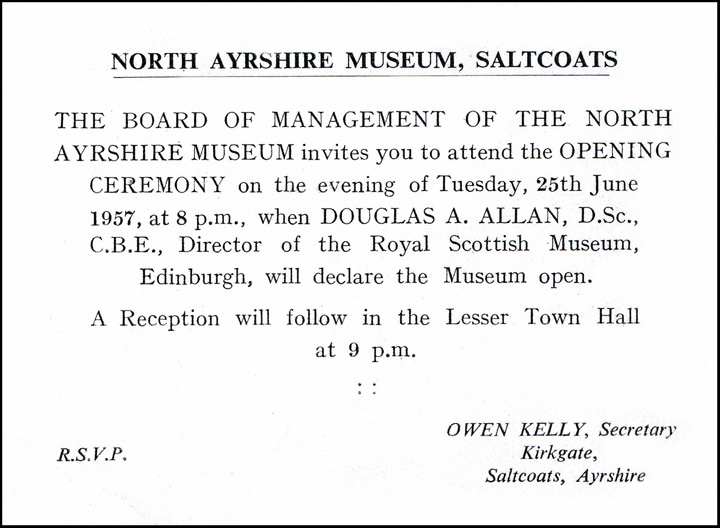 On 25 June 1957, the North Ayrshire Museum, later North Ayrshire Heritage Centre, opened in Saltcoats on the initiative of Owen Kelly. The sarcophagus was not listed among the exhibits named in newspaper reports on the opening ceremony implying that it was not in the Museum on its opening day. The coffin was taken to the Museum in 1958 according to a story, to be included later, in the Ardrossan and Saltcoats Herald of 2 December 2005. The cartoon below dates from the late 1950s or early 1960. Its origin is unknown. 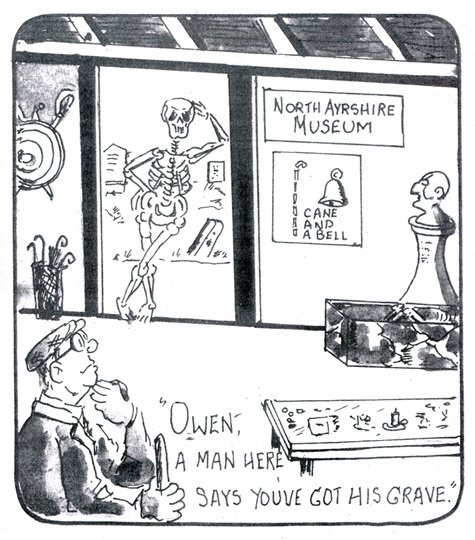 Late 1950s or early 1960s The Owen referred to is Owen Kelly who founded the North Ayrshire Museum, later North Ayrshire Heritage Centre. No change to the previous report. The stone coffin is now displayed in the North Ayrshire Museum, Saltcoats, together with leather fragments of a possible sandal said to have been found within the coffin. No accession or catalogue numbers. This is the only document that suggests that the leather may be from a sandal. As stated previously, it feels soft like suede and is pliable without the rigidity of modern shoe leather. SCRAN is a charitable online learning service with nearly half a million images and other media from museums, galleries and archives. It is based in Edinburgh and was formed in 1996 for ‘the advancement of education by enabling public access to Scottish cultural resources and related material’. 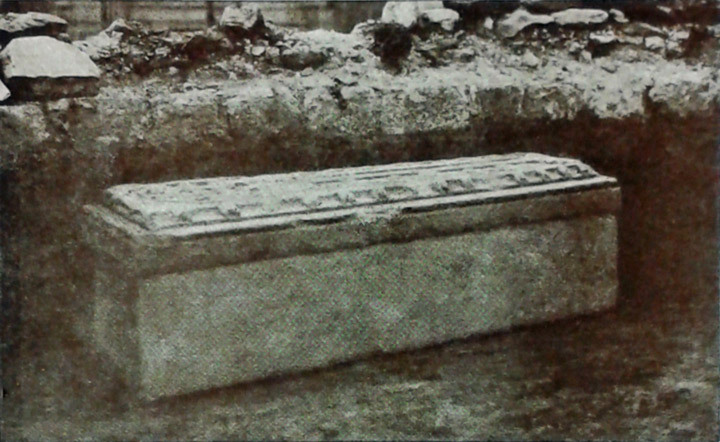 SCRAN has a photograph of the sarcophagus with the annotation below. 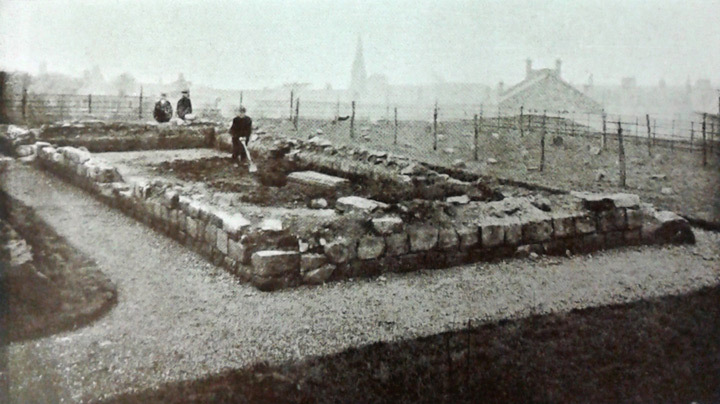 The coffin was found in 1911 during excavations of the pre-Reformation Ardrossan Parish Church. It would most (likely) have been made by a French mason working on the construction of Kilwinning Abbey during the late twelfth and early thirteenth centuries. The base of the coffin is hollowed out in the shape of a man and the lid is decorated with an ornate Celtic cross, fleur-de-lys border and a sword. The sword identifies it as the last resting place of a Knight Templar. The Knights of the Temple of Solomon were formed in 1128 to protect pilgrims journeying to Palestine after the First Crusade. They became a powerful force in Europe and were eventually suppressed in 1312 by Philip IV of France and Edward II of England.